Responding to an executive summary is one of the most challenging parts of an RFP, but it’s also one of the factors that will influence your organization’s win potential. Writing an RFP effective executive summary means thinking first and foremost about the words that make up the phrase itself…executive and summary. A person with senior managerial responsibility in a business organization. The person or branch of a government responsible for putting policies or laws into effect. Dispensing with needless details or formalities; brief. Put simply, an executive summary for any RFP is executive. The person who reads your response is going to make an executive decision about whether or not they will choose your solution or another. It must be high-level and concise. It must be relevant and worthwhile. So, how do we do this? How do we craft the best executive summary that ticks all of these boxes? Look no further, RFP responder. Here are some tips to guide you toward creating a stronger response, along with an RFP executive summary example that will increase your win potential. What’s the Difference Between a Cover Letter and an Executive Summary? Before we dive into some details, first we have to point out what an executive summary is NOT…a cover letter. This is a confusing part of the RFP response process, so we’ll break it down for you. Remember the definition of executive? Executive is all about distilling everything down to the most important points. Like a thesis, you’re going to explain your solution in one brilliant piece. Unlike a thesis, brevity is favored and an RFP executive summary is typically one page in length. An RFP executive summary is not a letter to the organization who issues the RFP. It is high-level content from the executive perspective that covers challenges the issuer is facing, and how your solution will help them overcome those challenges. The executive summary doesn’t talk about the details of the RFP response you’re providing. On the other hand, a cover letter for an RFP response is similar to any other cover letter. Think of the most common application..applying for a job. You talk about how great you are, right? Well, with RFP response your cover letter shouldn’t talk about how great you are, because the issuer may not bother with the rest of your responses if you put them off. Your cover letter should be a conversational introduction that mentions you are responding to their RFP because you would love to partner with them, then explain what you are providing in your RFP response. There is another key difference between a cover letter and an executive summary. A cover letter is almost always required while an executive summary is only sometimes required—and therefore optional in an RFP response. Being that an executive summary in an RFP can add a lot more value than a cover letter alone, you are correct in thinking that it is worth going the extra mile to stand out among your competitors. The trick is doing it well. Learn the anatomy of an RFP and start responding to the most common questions with confidence. So, what makes an RFP executive summary effective? Here are some quick do’s and don’ts to guide your efforts throughout the RFP response process. Remember the Issuer – The decision-maker reading your executive summary chooses whether or not you are the partner with the answer to their problem. Step out of your shoes and into theirs to address their pain points. State Criteria Upfront – Your buyer wants their requests to be accommodated. Avoid going rogue by stepping outside their list of requirements. You also don’t want to be too generic—if you repurpose an executive summary, be sure to customize the language. Keep Ideas High-Level – Brevity is key. Since you don’t have a lot of real estate on a one-pager, skip the nitty-gritty like steps and details. Messaging should be conceptual, but geared toward why your solution is the best choice. Present Your Solution as the Right Fit – Clearly state why your product or service is worth the investment. Don’t just say you will accommodate what they want. Show you listened by providing relevant information—not just a list of features and pricing. Review Content Thoroughly – Don’t go it alone. Too much is at stake with an RFP response. Involve the marketing team, your sales manager, or SMEs (subject matter experts) that will provide feedback to make your executive summary stronger. 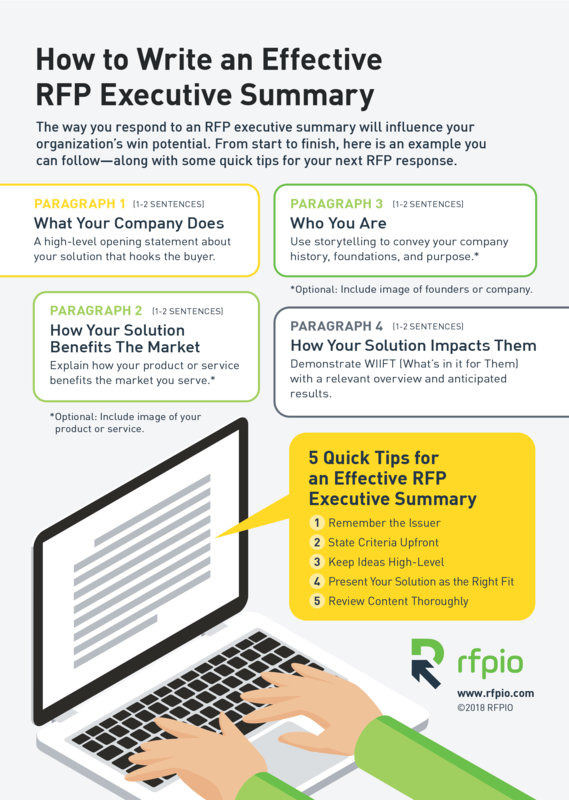 Length matters with your RFP executive summary—one page is all you need. Revisit the “summary” definition from earlier. The goal is to address the issuer’s challenges and present yourself as the solution in a few short paragraphs. An exception to this rule would be if you’re responding to a military defense RFP that’s 2,000 pages long. Then, your executive summary will presumably be five pages. For most of us RFP responders, keep it to one page to get your point across without letting the content drag on. Another thing worth noting is the visual component. An image is a great way to add some flair to your executive summary to stand out among your competitors and pack more of a punch. 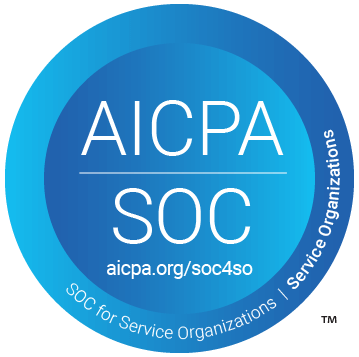 An executive summary is a chance to make your organization shine. This RFP executive summary template will help you create more effective content—the other piece of the puzzle is how you leverage technology like RFP software to do it efficiently. There are many ways RFPIO can help you craft the best executive summary in less time. Schedule a demo to find out more. 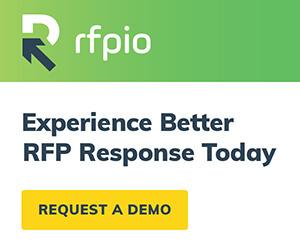 As the Senior Account Executive of RFPIO, Konnor Martin helps organizations understand the value of RFP software, so they can improve and scale their response approach—and win more business. With more than eight years as an executive sales professional, Konnor is highly experienced in training and development, territory management, software sales leadership, international business, and developing industry best practices. Connect with Konnor on LinkedIn.